To get the best results, you need to work out hard and smart. IdealLean Pre-Workout packs ingredients that support both the mental and physical aspects of training, so you can unlock your full potential and have the best training experience possible. The Energy and Focus Blend will help support your mood and concentration during your training, and the Endurance and Blood Flow Blend will allow you to push yourself even further towards your ideal body. I got the mango flavor and it's one of the most stomach -able pre workouts I've ever tasted. It's very tasty though very sweet. I mix it with 2-3 ounces of water so that it's more like a shot because when I need pre workout i don't have time to drink a bottle and it mixed well which is a huge plus. The boost is amazing. It's immediate and powerful but doesn't make my hands tingle like other PWO's I've tried. I do far only do 1/2-3/4 scoops and it's the perfect boost. It provides very even energy if that makes sense. 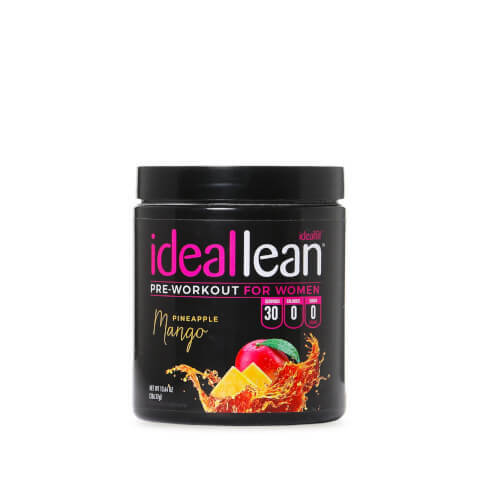 Can't wait to try more ideallean PWO flavors but would recommend mango! Love all Idealfits products such a great price and taste so good. Thanks Idealfit for offering affordable and delicious products. The flavor is amazing! Yum! Love the extra sweat and burn from the boost to work out harder. Thanks! Amazing! Love how it tastes and most importantly helps my recovery! I tried the Watermelon Ice flavor and it is so sour I could hardly drink it! It did work well as a pre-workout but wow is it hard to drink. This is amazing and has amazing taste. I have only tried the pineapple mango and love it but would love to try others. This stuff gives me energy all day long not just for my workout. I love this stuff!! It tastes great and it helps me keep my energy going not just during or for my workout but also during my day!! I have tried a couple IdealLean preworkouts flavors and have enjoyed them. I get the boost before working out but not as strong of a sensation as another brand I tried, which left me itchy. I recommend trying these! The watermelon ice is a little sweet but is very good! I love the tingle from the pre workout! Gets my pump going even more! This product gives me great energy to get thru my workout! Man, I love the way this gets me through a workout and the price point is great. But no matter how much water I add, the sweetness can not be cut down enough for me. And this is coming from a girl who loves sweets. I have it with me on vacation and though maybe it was just me thinking it was too sweet. So I had six of my family members try it and they all agreed they wouldn't buy it. I'm really bummed about it. I'll finish my jar because I love the results, but won't be ordering it again. It's too hard for me to drink something so sweet and strong at 5:20 am. I like the extra energy I had during my workout but even doing 1/2 scoop and 20 oz. of water it was pretty sweet. Not sure I will buy again. I am doing a 6 week challenge with my CrossFit gym so hoping this will help me see better results at the end. This is really good and it kicked in fast!! I was able to workout with shorter rest periods and push through harder! I absolutely love pre-workout!! It helps get me going first thing in the morning for my workout!! My husband and I both use this pre-workout and are absolutely obsessed. We get a mild tingle (nothing like others we have tried and disliked, it's not too bad) and the pre-workout gives us energy to really push ourselves. The flavors are super tasty and we love the fact that there is a fat burner included. Will buy every time. I love the preworkout! My favorite flavor is pineapple mango. I have tried watermelon ice and just ordered the newest pre workout flavor. I like pineapple mango because its such a unique flavor for a preworkout. It also doesn't give you the jitters. I love this stuff!!! Works so good and tastes amazing! I tried the watermelon ice flavor before, both are good. When I had it the first time I could tell a difference in my workouts, but it's been a couple of months since I us don't due to eating a clean, raw diet. I just started using it again, and the first day I did I had multiple people ask how I did that well on a workout. It works well, no jitters, and I don't feel any other side affects people talk about preworkouts having. *i don't like fizzy drinks. If you make this by the directions in 8oz water I can't get it down withought forcing it. I mix it in 1-2oz, enough to mix powder, drink, and then drink 8oz of plain water after it. Taste great! Gets me motivated to work out harder!